The last few days have been simply unimaginable. So much so that I can hardly type. Last week was pretty trying; I discovered that what I though was a nasty break out around my mouth was actually impetigo, a staff like infection that causes open sores that weep, then scab, then crack and bleed, all over the face. The good thing is that this led us to diagnose Jane's impetigo, which we had written off as bug bites that she had scratched and irritated (hers are on her legs and trunk). The next day our land lord let us know that she liked what we had done with her house so much that she wants to move back to Bukaya! We have until Novemeber to be out. The thought of moving my 13 children to another house is overwhelming to say the least, and much worse when you have open sores all over your face. The next night, our dog Entula gave birth to eight puppies. Thats right. 13 children, 10 dogs, 2 goats, 2 chickens, sweet Christine, our visitor Carell and I. Oh my. I actually wrote on my facebook Monday, "I have 13 children, 10 dogs, 2 goats and 2 chickens. My life could not be more crazy, or more full!" I was wrong. God could have brought me a crying mother holding her 4 pound 4 month old baby girl who could hardly breathe. And He did. My dear friend and employee brought her sister Susan here yesterday with her 4 month old baby girl, Happy. At first glance anyone would have thought this little thing was dead, but upon closer inspection I could see her chest, barely moving in and out. We rushed her to the nearest hospital where they put her on IV fluids and oxygen. This morning we took her to International Hospital in Kampala, the biggest and most modern hospital in Uganda, though still lacking compared to what we are used to. After much testing it was concluded that little Miss Happy has a 9mm hole in the wall between the ventricles of her heart. This means that her heart can not oxygenate blood properly causing the left ventricle to fail. This causes extreme pulmonary distress which leads to very fast heartbeat, decreased appetite and poor weight gain. More here. Aside from all this medical gibberish, what I am trying to say is, we need HELP. 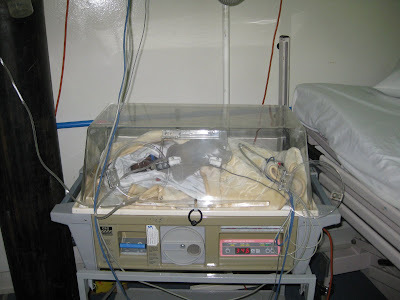 We have admitted Happy in the best hospital Uganda has and this is not free (no health insurance here...) They have her on a feeding tube to increase her weight (she is too small to withstand the heart operation that would be necessary to fix the hole), oxygen, and IV fluids. They are hoping to keep her like this at least for a few weeks to try and stabilize her. This treatment costs $500.00 for three days, that is about $5,000.00 for the month. After that we will need money to proceed with the surgery, though I am not sure of the price. They may be unable to do the surgery here, in which case we would need to fly to Nairobi, Johannesburg, or worst case scenario, the US. I try not to be frustrated by the lack of necessary equipment and medical care here, by the fact that a simple check-up when she was a few weeks old could have caught and prevented all of this. 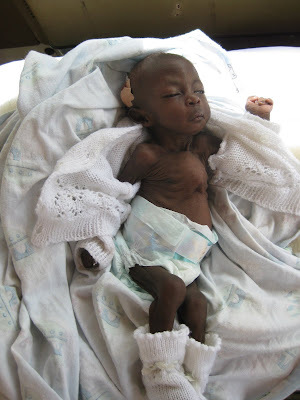 We know that although we can care for this baby, it will ultimately be the Lord that heals her. I look into her big, curious eyes and see the big plans He has for her life. So I ask first, of course, for your prayers. Pray that the Lord's mighty touch would strengthen Happy supernaturally as the doctors work diligently to stabilize her. That she would be at peace and free from fear and pain. That her mother's heart would be comforted with His peace that transcends all understanding. That the doctors would have stamina and knowledge and wisdom and courage. That the funds for all of Happy's medical expense would just fall from the sky; we know that He meets all our needs in accordance with His glorious riches. That doors would be opened, and God would guide our steps as to where we go from here. That people would see God work a miracle in little Happy's life, and that HE would be glorified above all else. I am hoping to raise $10,000.00 for Happy's medical bills, to cover the costs of her current hospital stay as well as the upcoming surgery, wherever and whenever that may take place. You can donate via the paypal button on the side of this blog, simply write "Happy" in the note area. You can also mail a check to Amazima Ministries (info at side) with Happy in the subject line. sweet big eyes, wonder what all these doctors are doing! Isn't it so like God that her name is Happy. Every time I talk about her I must use the word HAPPY, and it almost sticks in my mouth because this situation seems anything but. And I am reminded that God calls me to remain joyful. HAPPY. The JOY of the Lord is our strength and it is never fading. Thank you, thank you for that, Sweet Jesus. Oh, precious baby. I am praying. wow i'm so behind....thanks for the catch up...prying for u, fam and happy!!! love u and can't wait to see you!!! You don't know me. I pray for you, your family and your ministry often. My name is Abby, when I was in 1st grade I got into trouble from a teacher that didn't know me, she said "what is your name? ", choking back tears of fear and shame, I quietly said 'Abby'. She said back to me "Happy? What kind of name is Happy?" I thought that was an odd question for a number of reasons. I remember thinking. 'Happy is not my name but, it's not so bad....seems pretty fitting to me....' So obviously that sweet little baby named Happy is on my heart today. I will be making a donation for her in the name of that grumpy teacher from the 1st grade. Blessings, prayers, and MUCH strength to you! I have now prayed for Happy, and I will continue to pray for her, her health, her Mother, and that the money will come to pay for her hospitalization and possible surgeries. God is Good. Oh Katie, I have tears streaming down my face as I gather all my children together to pray for this baby, her mom, and funds for everyone! As a family we pray for you all the time and the ministry you are doing! Josiah Vince says hell Auntie and that he is going to come visit you someday! 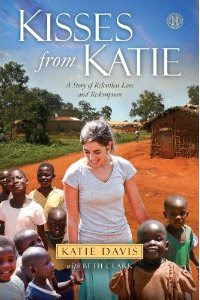 Sweet Katie - praying over you and baby Happy! Father, please grant every need of Your children in Your perfect timing and let Your will be done! We love You Father and praise Your holy name above all others! Big hugs and many prayers being lifted for you Katie! Tears started down my face as I read this and looked at the pictures of precious Happy. I'm praying for you so much, Katie! Praying for you and your beautiful family and all the people touch with your life. wow so tiny!! We're praying!! Is there any way to get her a medical visa to have the surgery in the States? Some friends of ours just adopted an 8 year old girl with heart problems. I spent 17 days in Ghana with her, completing the paperwork to get this precious girl home. We arrived home a week ago, and yesterday she was rushed to ER. She is in ICU now, awaiting emergency heart surgery. Looks as if our paperwork had been delayed even one week longer, this precious child would not have survived. We are praising Jesus for getting us home in time. Taiger and I are sending up big prayers for you, your family, Happy, her Mother and family and friends, and the doctors and nurses caring for Happy. The pictures are amazing...she is so tiny. Praying mightily for you all and Happy. Praying you reach your goal. You are such an inspiration to us. Oh little Happy.... I pray she receives just the right care she needs and that the funds are raised to pay for her stay and her surgery down the road! thanks for the challenge! praying daily for you and yours...and this little one. 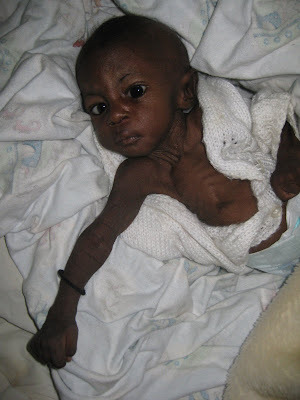 We are in the process of adopting a baby with VSD from Ethiopia. Is is heart breaking how the lack of medical resources makes treatable, manageable conditions life threatening. I'll be praying for Happy! Katie, we are praying for Happy!!! This post broke my heart...my tears for this precious baby hit so close to home. We are grateful everyday for wonderful medical provisions for our adopted daughter from Ethiopia. So tiny and so in need of big miracles. Please keep us updated... we will spread the word immediately!!! katie, i just made a donation through the paypal link, with my credit card...but it didn't let me identify "happy" or anything. when my gift is processed, please know that i am intending it for her health care. i'm sorry if i did it incorrectly. thank you. I've been reading your blog for a while now and I rarely comment, but I am always just wowed by you and your faith and all of the amazing things that you do in Uganda. Praying for you and all the kiddos, and especially precious baby Happy. Those beautiful brown eyes of hers melt and break my heart. Hi Katie - I know you have absolutely no time; but I need to get in touch with you. I am not in Uganda at the moment; but I work with some people that might can help. Please e-mail me with your phone number and I will call you as soon as possible. The e-mail is misscalloway1@gmail.com. Thanks. Praying for you, your family, for God to lead you to your new home (which knowing HIM will be bigger and better than the one you have now), and of course for healing and provision for baby Happy. Praying for His abundant provision, peace and strength to rain down on you my sweet sister in Christ. I seem to recall a post a while back where you said you wanted a bigger house . . . and I can´t help but think that this eviction is just moving you in that direction. :) It´s frustrating at the time, but as you well know, God has it all figured out. Happy is such a precious baby. Those big eyes are certainly the eyes of a child bound for life, to me! I´ve seen babies that were dying and though her body is definitely in a fragile state, her eyes really do seem very alert! We would be humbled and honoured to help financially. Thank you for sharing this with all of us here. Continuing to pray! Oh Lord, come to little Happy's rescue. You have a cattle on a thousand hills, Father we need the money for this precious wee life. We ask it in Jesus' name and we believe Lord that YOU are able. I am praying!!!!! Praying for money, praying for guidance as you have to move, praying for healing, and praying for your strength!!!!! Lord pour out your BLESSINGS!!!!!!! Oh sweet Katie ~ I feel for you and the difficulties that you are encountering. I was reading about counting it all joy today...and how we become more like Him thru it all...knowing though that you already far surpass the majority of old adults I know...so really: What the heck?? Praying that tomorrow you can meet my sweet hubby and Emma and Graham...I am so anxious to see pictures of you all together...I can't wait!! Praying for dear, precious in the sight of Jesus, little Happy. Thank you for reminding me today, that there are many needs in our world. While we are fund-raising for our mission trip to South Africa, I cannot look at that sweet face and do nothing. What a perfect name for the precious little girl! what a perfect name for a precious little girl!